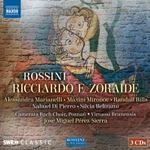 Ricciardo e Zoraide dates from 1818, and it is one of ten works Rossini composed for the impresario Domenico Barbaia in Naples, where they must have had a very strong contingent of tenors. Armida composed in 1817, requires six tenors, and in Ricciardo e Zoraide there are four in the cast of nine soloists, including the two male leads, Agorante and Ricciardo. The tale on which the opera is based was written as a send-up of the popular crusader tales, Ariosto’s Orlando furioso being the prime example. There is no hint of satire in the opera, a dramma serio in which true love triumphs and no-one dies. The Rossini Festival in Bad Wildbad has been operating since 1989. Why there? In 1856 Rossini took the waters there, and this led to an uptick in his composing (no more operas, though, as we know.) This recording features a Czech orchestra from Brno and a Polish chorus from Poznan; both seem to have adapted to Rossinian style, despite some uncertain brass at exposed moments (a pitfall of a live recording). José Miguel Pérez-Sierra moves things along adroitly and the soloists give full satisfaction. There is a good contrast between the two lead tenors, with Maxim Mironov (Ricciardo) having a more boyish sound than Randall Bills. Alessandra Marianelli delights as Zoraide (a role created by/for Isabella Colbran, who went from being Barbaia’s mistress to Rossini’s wife - now that could be an opera.) Mezzo-soprano Silvia Beltrami also excels as the distraught wife, Zomira. If I had attended this concert I would have been very pleased to have done so. The work is engaging and has many passages displaying Rossini’s amazing creativity. The big drawback of the package is the absence of a libretto. There is one on the Naxos website but it is only in Italian. The scene-by-scene synopsis is nicely detailed, but it is frequently hard to discern which singer (especially among the tenors) is singing at any given moment. The highly-regarded Opera Rara recording comes with libretto and translation.